Smoke extractors are essential in the welding workplace to protect welders and other people from welding fumes. All metals produce harmful gasses, some even cause deadly conditions. Smoke extractors are designed to trap these fumes and gasses and prevent them from spreading to the welders breathing zone, clean air is then recycled back into the air. Smoke extractors also prevent failure to meet Occupational Safety and Health Administration welding ventilation standards. 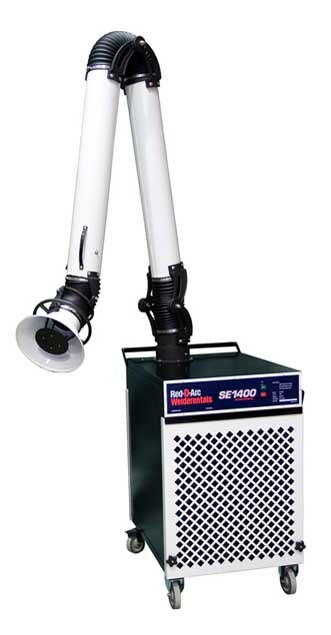 Red-D-Arc offers two smoke extractors, SE1400 and SE1602W. SE1400 includes a Snorvac 10’ fume extractor snorkel arm which captures fumes 12-20″ from the source within an area of 20″ diameter. The arm can be rotated 360 degrees and the unit rolls on wheels making a versatile and flexible filtration unit that can be moved between work stations. SE1602W is lightweight, stainless steel enclosed and suitcase-size making it easily portable. It includes two suction levels while two hoses are available to fit your needs. Both models provide a high volume and high degree of filtration- up to 99.9% efficiency. Washable and reusable or disposable filters are available.